Aging is a natural phenomenon associated with every living being. The first signs of changes are visible on the skin. Wrinkles, lines, dryness, dullness in skin tone, and thinning epidermis layer are some of the external symptoms. Shrinking muscles, fatigue, and reducing immunity could be the other internal symptoms. Awareness of these symptoms could lead to stress and anxiety which might speed up the process of aging. When these signs appear at 60+, you may not worry too much about them. But at 30+ or 40+, they may create a sense of panic. Premature aging could happen due to many factors related to physiology, psychology, lifestyle, exposure to pollution, etc. There is a solution and it is well within your reach. 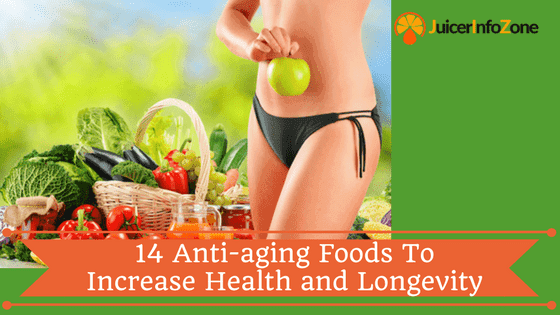 Anti aging foods provide you with the vital resources of energy, strength, flexibility, freshness, youthfulness, and create a deep sense of sense of fulfillment. Of course, they are also delicious and satisfy the taste buds on your tongue. Energy: Anti aging foods slow the appearance of the external and internal symptoms of aging. They prolong the life of every cell and tissue on your skin, muscles, and the internal organs. They enhance the volume of energy produced in each cell by increasing the efficiency of the mitochondria. They help preserve the energy. Hydration: Hydration is a process which eliminates the dryness in your skin and muscles. It injects the essential fluids for increasing the liveliness, brightness, and the tone. It also eliminates the internal fatigue and the accumulated stress in each cell. Collagen: Anti aging foods promote the growth of new cells, collagen, and the Elastin. Dead cells wither away to give space for the lively and the young cells. Wrinkles disappear. The aging lines vanish. Your skin becomes firm, flexible, soft, and bright. Muscle-Mass: Anti Aging foods eliminate the waste from your muscles. They burn fat and tone the muscles which also become lean and flexible. Endurance levels increase. The effort you put on the workouts produces “extra” results. Youthfulness: Anti aging foods restore the youthfulness in your skin, muscles, and the internal organs. Metabolism becomes more efficient. Cardiovascular system gets strengthened. Immunity levels improve considerably. Impact of UV, heat, pollution and the external elements reduces. The time for regeneration of energy shortens. The transformation is similar to the life of a tree from the autumn to the spring. But the only difference is its longevity. The changes that happen in your body don’t disappear too soon since they are natural. You can enjoy the fruits of youthfulness for decades. Consistency: Select the best combinations of anti aging foods that match with your present physical and health conditions. Try and increase the choice of foods to avoid boredom and burnout. Be consistent in consumption. Workout: Workout could start with an early morning walk or jog. Stretching your muscles, lifting weights, aerobics, and Yoga burn calories and fat and increases appetite. Water: Drink plenty of water and healthy fluids. Eat more fruits. They improve digestion, eliminate waste and keep you healthy and fit. The key parameters you have to consider for the best anti aging effects are related to skin, muscles, heart, fat burning, and metabolism. The brain health is an added benefit which helps you achieve better mind and body coordination. 4OZ of salmon contains approximately 166 calories. Fat content is 7%. Protein content is a whopping 62%. It is rich with sodium, potassium, and calcium. Key vitamins are A, D and C. It also contains rich sources of antioxidants, Astaxanthin and omega 3 fatty acids. Salmon is a rich source of fatty acids for improving skin moisture. It helps generate plenty of keratin and collagen. The skin becomes firm and resistant to wrinkles. The supply of vitamin D ensures brightness and tone. Astaxanthin is the ingredient which eliminates the effects of skin oxidation due to the accumulation of toxic elements and UV. It is also responsible for the improved skin immunity against acne, rashes, and the black spots. Salmon contains high volume of calories. The skeletal muscles can absorb them and convert into useful energy for toning and muscle-mass development. The calories boost the endurance for performing hectic physical activities. Reduction of stress and fatigue results in enhanced athletic fitness. Salmon is highly beneficial for muscle relaxation after heavy workouts. The omega 3 fatty acids boost the level of fatty acids in the circulation for boosting the heart’s pumping capacity. They also burn fat and cholesterol in the blood veins and reduce the blood pressure. They eliminate the layers of plaque on the cardiovascular organs and protect from stress. 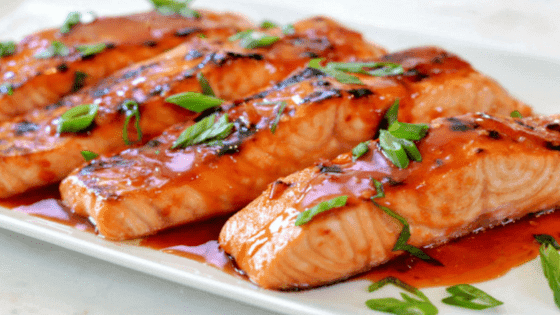 Salmon can burn fat from the abdomen, hips, glutes, thighs, and the back which is normally difficult to remove. The burnt fat is converted into fatty acids and glucose which gets converted into glycogen. It is stored in the muscles and internal organs for producing energy while performing physical activities. Salmon generates fatty acids from fat burning. They streamline the metabolism and convert the foods into proteins, vitamins and the other forms of nutrients. The Central Nervous System (CNS) gets strengthened due to the proteins. Elimination of waste from the kidneys and the bowels keep the body free from toxic elements. Salmon‘s protein ingredients enhance the stability and the agility of the brain neurons. The interpretation and processing of the signals from the other parts of the body becomes efficient and faster. Hence, it improves the active state of the mind and body. The strength of the brainstem increases considerably. Increased coordination between the mind and the body helps in balancing the physical fitness, health and a state of youthfulness. 17 grams of Sprouts contain approximately 5 calories. Fat content is zero. Protein content is 50%.Carbohydrates content is 50%. Dietary fiber is 2%. Key vitamin is Vitamin-A (26%) with Vitamin K, and A. They also contain rich sources of antioxidants. Iron and zinc are the key minerals present in sprouts. Hydration, skin tightening, flexibility, softness, protection from dryness, wrinkles, and probable cancer are some of the skin benefits of sprouts. Vitamin A strengthens the skin layers from the epidermis to the base. Dead cells are the key elements which increase the pace of aging. Vitamin A replaces the dead cells with newly created healthy cells. 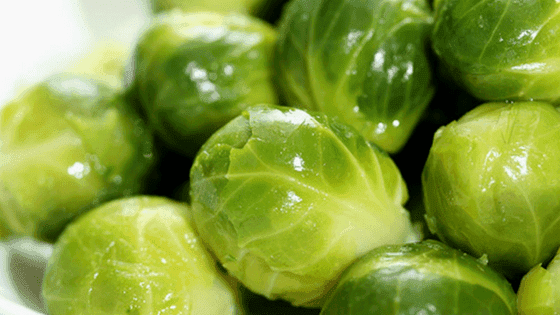 The antioxidant property of the Sprouts helps in the removal of dead skin. So, your skin stays youthful for many years without sagging. Premature hair loss is a major health problem for the middle aged persons. The main causes are lack of vitamins, pollution, and the deposits of dandruff. Sprouts can eliminate dandruff, increase the hair root strength, and enhance the scalp health. Zinc is the mineral responsible for the balanced generation of the Sebum on the scalp. It keeps the hair moist, healthy and free from stress. Hair regeneration frequency increases. Impure blood is often the main reason for the premature aging of the skin and the body. It may happen due to toxic elements, from foods, UV, beverages, etc. It may also be due to the body’s inability to eliminate waste properly. Sprouts clean up the liver, intestine, gallbladder, kidneys, and the other internal organs. They also clean up the blood from the toxic elements. Supply of oxygenated blood increases the health of the metabolic and the cardiovascular organs. Sprouts contain rich sources of carbohydrates which can get converted into useful energy by the pancreas through insulin. This energy is highly useful for keeping your heart healthy and functional. It happens due to the strengthening of the soft muscles and the nerves in the cardiovascular system. Being rich in vitamin A, sprouts can boost the body’s energy levels by eliminating stress. The muscles, joints and the tissues in the body relax and energize. 17 grams of Seaweeds contain approximately 30 calories. Fat content is zero. Protein content is 21%.It is rich with sodium, potassium, and calcium. Dietary fiber is 2%. Key vitamins are A and C. Iron content is 17%. Polysaccharides and iodine are the other main ingredients. The vast range of Seaweeds types like the red algae, green algae, Fucales, and plenty of others serve as nutritional diet for multipurpose health and skin benefits. Seaweeds improve the skin texture and tone with the rich ingredients of minerals, and protein. They eliminate most of the harmful bacteria which accumulate on the skin surface and improve the immunity. Skin moisture restoration, collagen generation, removal of dead skin, binding of collagen with the skin cells and tissues are some of the primary functions of the seaweeds ingredients. Iodine improves the radiant properties of the skin cells. It also promotes faster healing of the skin from rashes, acne, red spots and other skin disorders. Promotion of hair growth, strengthening of the scalp, balancing the sebum oil content, and elimination of scalp infections are the key benefits for hair and scalp health. Seaweeds improve the strength of the muscle fibers. It improves the bonding of the Myofibril and enhances its density. When you work out with weights and stretching exercises the myofibril hypertrophy increases to considerable levels. It results in vast improvement of the muscle mass and tensile strength. The ligaments and the tendons become flexible and strong when you consume the seaweeds regularly. Seaweeds prevent the muscle atrophy, swelling, and degeneration. They preserve the structural integrity and tone. 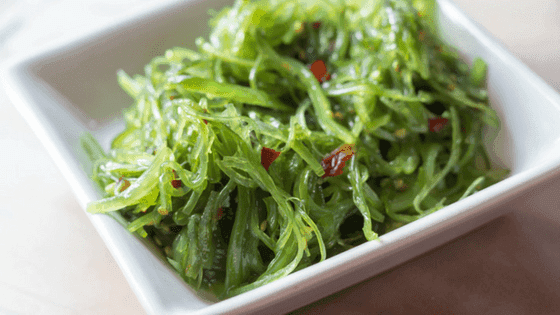 Seaweeds can convert the LDL cholesterol into HDL improves the cardiovascular health conditions. Circulation becomes normal and the blood pressure gets restored to the healthy levels. Your body is now capable of enduring stress without developing stress and fatigue. Seaweeds improve the bone density at the locations of the main group of muscles in your body and the joints. Seaweeds can resist the aging effects of bone decay and weakening by enhancing the bone’s tensile strength. 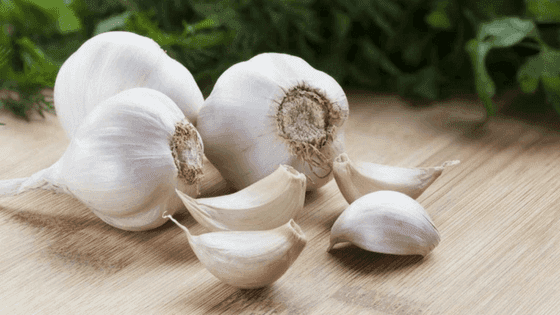 The key component of garlic is Allicin. The other ingredients are vinyldithiins and allyl sulfides apart from the ajoene which also plays an important role as the active garlic ingredient. Garlic contains 23% manganese, 17% vitamin B, 15% vitamin C. Garlic contains 17 types of amino acids. Garlic is a powerful antioxidant which detoxes all the internal organs in your body that connected directly or indirectly to the skin. It cleans the skin pores and enables free flow of air though the epidermis layer. The result is the elimination of heat and humidity, which cools the skin layers. The Allicin ingredient of the skin reduces the skin oxidation due to UV. Hence, the formation of excess sebum and the acne get reduced by more than 90%. The ingredients of garlic also eliminate the toxic elements from the skin layers. Now the skin can absorb all the vitamins and protein ingredients from the circulation. They result in formation of collagen layers which bond with the individual skin cell. The firmness of the skin increases. Hence the wrinkles and the aging lines disappear naturally. Garlic is stated to improve the generation of testosterone in the males. In the case of females it increases the generation of HGH. It enhances the hypertrophy of the myofibril and enhances muscle mass. It relaxes the muscle cells and tissues and prepares them for the tougher physical workouts. When you say that you are young at heart, it literally means it’s strengthening through garlic. It stimulates the heart and cardio muscles to pump more blood with every compression and expansion of the soft muscles. There will be considerable improvement in the heart health and fitness. The results are naturally the enhanced probability of anti-aging effects on your entire body, including the skin, heart, muscles and the other internal organs. Garlic can strengthen the joint muscles, ligaments and the bones due to its active ingredients. The amino acids enable the muscles to release the fatty content into the blood and convert them into unsaturated fatty acids. They in turn get converted into Glycol through the formation of glucose. The procedure results in the storage of energy in the muscles. Your body becomes stronger, faster, slimmer, and healthier. You can naturally experience the anti aging effects in all the aspects. 30 grams of raw almonds contain approximately 170 calories. 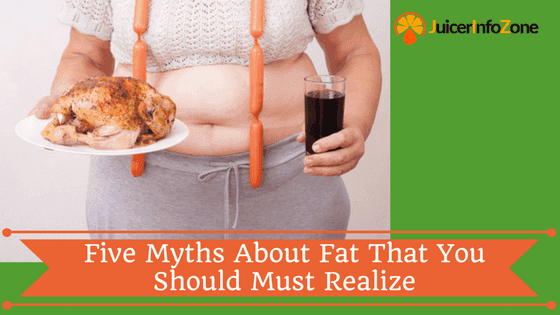 Unsaturated fat and fatty acid content is a whopping 74%. Protein content is 13%. Carbohydrate content is 17%. Dietary fiber is 16%. Key vitamin is Vitamin-E. They contain rich sources of bio active molecules. It contains antioxidant ingredients. Raw almonds can improve the health and fitness of your skin from the tip to the toes on your body. The primary task is to improve on the flexibility and tensile strength. For this, they eliminate the toxic elements from the skin layers due to the antioxidant ingredients. The pores get cleared and the control on the sebum production ensures zero hair loss on the scalp. It also eliminates the possibility of the acne, rashes, psoriasis, dermatitis, and blisters. Raw almonds increase the hydration levels remove the toxic elements in the skin cells. The it fills the empty space with the rich supply of proteins, minerals, and the other nutrients. So, each cell on the skin becomes FULL with the energy, strength, and flexibility. Raw Almonds can also increase the concentration of collagen on the exterior and the middle layers of the skin. Now, your skin gets firmer and flexible. It is the stage when the anti aging symptoms like the wrinkles, lines, and inflammation get controlled. Anti aging effects become more profound when the skin health is matched with the perfect health and strength of your muscles. Raw almond can repair the muscle and joint injury through its reliable interaction with the receptors on the muscles. Injury, damages, and the deteriorating conditions get healed within the shortest span of time. 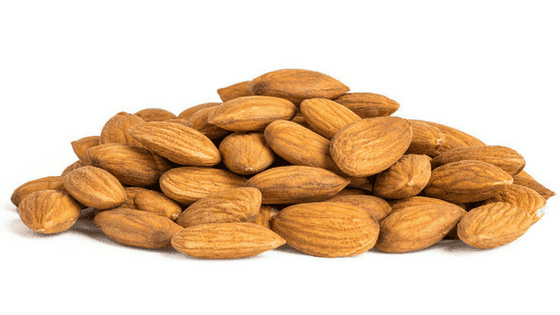 Raw almond can extract the muscle strengthening ingredients from the other nutritious foods and get them processed at the intestine and liver levels. It transmits the generated energy into the muscles in eh form of glycogen, and the other storable forms. Now, your body can fine tune the various muscles into perfect coordination with each other. Raw almond is recommended for the heart health and efficiency due to its fatty acid content. It can convert the LDL cholesterol into the HDL and the other basic ingredients. They are taken away from the blood vessels and the other circulatory systems. The purified path of circulation puts the minimum stress on the heart. So, the efficiency of the heart performance improves. 30 grams of Oysters contain approximately 80 calories. Unsaturated fat content is 27%. Protein content is 35%. Carbohydrate content is 31%. Key vitamin mineral is iron (35%). They contain rich sources of zinc, calcium, and selenium. Key vitamins are Vitmin-B12 and vitamin-A. Oysters are the natural synthesizers of collagen from the ski and the connective tissues. Certain forms of collagen for the skeletal muscles are produced by the bones also. Wrinkle and aging lines removal is the first anti aging task of the oysters. In the second stage they increase the skin moisture. Many people often confuse moisture with watering the skin like you it for the plants. On the contrary, the process is entirely different. The ingredients of oysters can interact with the skin cells and the water molecules to create the skin friendly fluids (filled with the vital proteins and vitamins). The formation of the layer on skin’s interior and the exterior prevents the drying and shrinking of the cells. Now, the cells can eliminate the toxic elements from their interiors and increase the skin health, tone, and the brightness. Oysters boost the muscle mass formation with the minerals and proteins. The Myofibrils in the muscles can wear out due to lack of physical workout. The proteins in the oysters bond with the fibers and increase their density. This process can result in the anti aging effects when you perform the physical workouts on the muscles. They key muscles you have to consider are in the abdomen, hips, glutes, thighs, legs, chest, and the back. Fat burning leads to the generation of fatty acids. They in turn combine with the carbohydrates derivatives like the glucose which in turn gets converted into glycogen. Muscles are the base on which the skin fitness and health are based, which in turn depend on the bone and joints health. 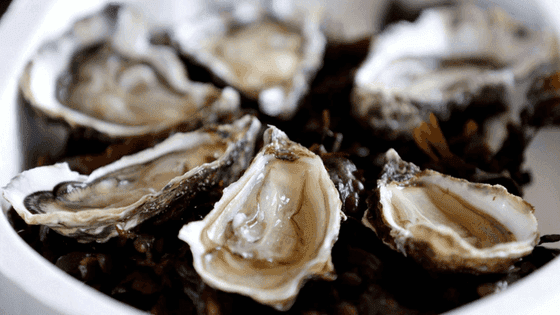 Oysters strengthen the joints, muscles, bones, and the connective tissues. They support the skin and enhance its anti aging characteristics. Oysters contain rich supply of unsaturated fat which also gets converted into fatty acids when consumed. It eliminates the cholesterol deposits on the blood vessels, and the cardiovascular muscles by converting it into HDL. The HDL is quickly absorbed by the circulation and transported into the skeletal muscles. So, the heart and the cardiovascular system functions more efficiently. One avocado contains approximately 322 calories. Unsaturated fat and mono-saturated and fatty acid content is 45%. Protein content is 5%. Carbohydrate content is 19%. Dietary fiber is 54%. Key vitamin is Vitamin-C (34%). They contain rich sources of bio active molecules and antioxidant ingredients. 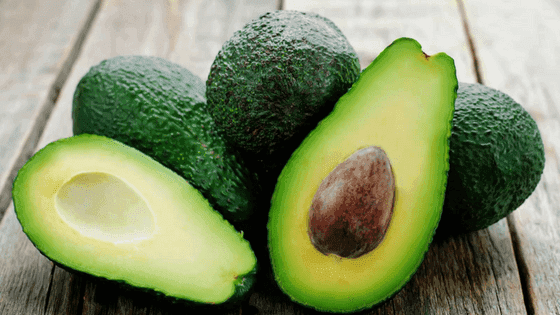 The avocado contains dietary fiber as the key ingredient. It eliminates the excess of sebum from the skin and balances its secretion. People with oily skin can benefit from the avocados, since they prevent the formation of acne. The soluble dietary fibers reach the skin’s hypodermis layer through the circulation. Here, they interact with the collagen molecules and form a bonding with the skin cells. The firmness of the skin layers increases considerably till the epidermis. Avocado eliminates the wrinkles and aging lines from the skin. It also prevents their recurrence. You can consume avocado in the raw form or apply the avocado oil on the skin. The antioxidant ingredients extract and eliminate the toxic elements from the skin layers. The clear the pores and enable oxygenation of the skin cells. Removal of dead skin gets streamlined and they are replaced with the new cells. Moisturizing the cells and tissues, and preservation of vital fluids improves the skin tone, brightness, and overall health. Avocado doesn’t provide strength to the muscles. Rather, it increases the flexibility and collagen bonding within the layers. It also eliminates the deposition of unhealthy fluids from the muscle tissues. It replaces them with fluids rich in proteins, vitamins and the other nutrients. Avocado prevents the sagging of muscles beneath the skin. Hence, the firmness of the skin is preserved. Avocado can improve the strength and flexibility of the cardiovascular muscles. The mono-saturated fatty acids can also eliminate the LDL cholesterol from the cardiovascular interiors. The process helps reduce the stress on the heart. Improved circulation due to cholesterol reduction helps the heart to stay healthier and stronger. Avocados can initiate the process of fat burning and help the muscles to store the glycogen, fatty acids and proteins from the burning. Your body tends to burn the fat from hips, thighs, abdomen, and the chest. Avocados can reduce the stress on the intestine and liver by the process of detox. Considerable improvement happens in metabolism and energy generation, besides waste elimination. 148 grams of potatoes contain approximately 110 calories. Total fat is zero. Protein content is 13%. Carbohydrate content is 90%. Dietary fiber is 8%. Key vitamin is Vitamin-C (45%). They contain rich sources of iron, calcium, potassium, Anthocyanin and other minerals. Pantothenic acid is another key ingredient along with Phytonutrients and antioxidants. Sweet potatoes contain rich sources of beta carotene. The beta carotene ingredient of sweet potatoes is converted into vitamin A. after consumption. It increases the immunity to the common skin ailments and infections. Macular disorder is one of the ailments that are caused by the aging skin. The Anthocyanin ingredient in potatoes eliminates the symptoms completely and restores the skin back to the healthy conditions. 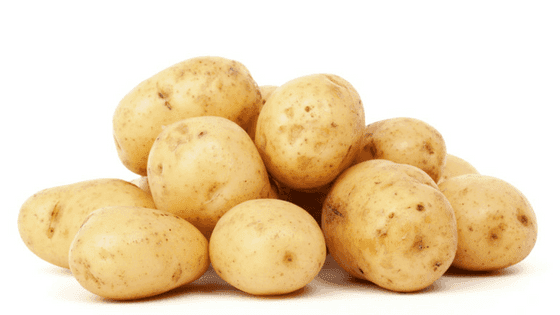 Potatoes can eliminate the possibility of acne growth on oily skin. You can crush it with water and take the stain. Apply the stain on the skin areas prone to acne. It can also help improve the skin texture, and remove the aging spots, rashes, and the wrinkles. The Pantothenic acid (Vitamin B5) is responsible for the growth of keratinocytes on the skin layers. They act as perfect protection layers from the heat, UV, humidity, and the pollutants. It increases the hydration levels in the skin cells and tissues. It reduces the skin sensitivity to the various forms of allergens by increasing the immunity level. Potatoes supply the required quantity of proteins to the muscles to stabilize their structure and the firmness. It also supplies the nutrients, carbohydrates and the minerals to increase the muscle mass. The muscle fibers increase their tensile strength with the iron and calcium ingredients of the potatoes. Vitamin C in the potatoes acts as an antioxidant. It eliminates the toxic content accumulated in the muscles. It results in the muscle relaxation and detox. Storage of energy and proteins enables the muscles to attain and sustain the optimum mass. The combination of healthy skin and strong muscles can naturally reduce the aging symptoms in the skin and the body. Freedom from stress and fatigue are the key anti aging benefits of potatoes. Potato juice in the raw form is an efficient fat burner. Anthocyanin is responsible for the restoration of healthy metabolic conditions. It eliminates indigestion, constipation and the other disorders related to the intestine and liver. Complete elimination of waste ensures healthy skin and body. The rich supply of proteins, beta carotene, Vitamin B5 and Anthocyanin is responsible for improving the cardiovascular health. It enables the free circulation, breathing, and the supply of oxygenated blood to the heart. It also eliminates carbon efficiently. One cup of chopped Broccoli contains approximately 31 calories. Total fat is 1%. Protein content is 27%. Carbohydrate content is 65%. Dietary fiber is 10%. Key vitamin is Vitamin-C (135%). It contains rich sources of iron, calcium, potassium, zinc, magnesium, and phosphorous, Omega-3 Fatty acids and niacin are the other key ingredients. Broccoli’s vitamin C is an efficient antioxidant. It can detox and restore the skin’s healthy conditions. It interacts with the origin spots of collagen in the skin, connective tissues, and the bones. It is responsible for the controlled generation of collagen and its even distribution to the various parts of the skin. Bonding of the collagen molecules with the skin cells and tissues is an important phase of anti aging effects. The wrinkles on your skin get eliminated gradually as you consume broccoli. You can also prepare a juice from raw broccoli by crushing it with water. Drink it early in the morning after brushing your teeth. It can have significant impact on the skin texture, brightness, and the elasticity of the skin. It eliminates all the aging spots from the skin layers and reduces the skin’s oversensitivity to UV, heat, and humidity. Broccoli’s vitamin C ingredient is responsible for the complete detox and fat burning in the skeletal muscles. It results in enhanced tensile strength, flexibility, and endurance capacity. Muscle growth can happen at any age between 30 and 40+ with no side effects. You can realize the full potential of broccoli when you start working your muscles regularly. Lethargy is one of the toughest enemies to conquer. It slows your progress towards getting youthful body and skin. Broccoli juice with lemon, avocado, and garlic can eliminate the lethargy and introduce a stream of freshness in your muscles. 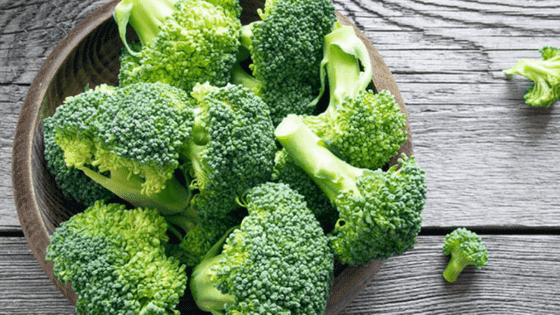 It is important for you to flex your muscles every day and perform at some simple exercises to experience the complete anti aging impact of broccoli. You can tart with the skipping ropes and walking. Broccoli contains omega three fatty acids which clean up the metabolic organs. They induce the appetite for healthy foods, and improve digestion. The average time required for the digestion decreases considerably till it gets optimized. Reduction in gastric problems, acid refluxes, and constipation ensures balanced metabolism. Broccoli streamlines the heart rate and normalizes blood pressure. It can improve the rate of circulation and exchange of oxygen from the lungs. Carbon and waste elimination keeps the heart healthy and fit. 3 OZ of Sardines contain approximately 185 calories. Total fat is 16%. Cholesterol content is 23%. Protein content is 47%. Key vitamin are Vitamin-C, Vitamin-D, and Vitamin-A. It contains rich sources of EPA and DHA. Omega-3 Fatty acids are the other key ingredients apart from the antioxidants. The best anti aging effect on your skin is the enhanced brightness due to the sardines. The vast number of mineral resources in the sardines increases the tensile strength and firmness of the skin. It can induce resistance to heat, humidity, and the impact of pollution. The vitamin C ingredient is an excellent antioxidant. It can scavenge the free radicals on the skin and prevent the process of oxidation which is normally aided by the UV. So, the probability of acne, rashes, red and black spots, and the other skin aging symptoms gets reduced to a great extent. Sardines provided lots of calories for your muscles to utilize. If you happen to be obese, it helps in the fat burning process. If you are lean or skinny, it helps in the development of muscle mass without accumulating fat and cholesterol. The anti aging effects of the sardines result in the restoration of muscles’ activeness and reflex actions. Muscle support for the skin improves its texture, tone, and the flexibility. Efficient metabolism can enhance the muscle mass and the skin health. The antioxidant ingredients clear the entire metabolic system from the toxic byproducts of fat and cholesterol. It improves the generation of digestive juices. It eliminates the acidic elements and reduces the probability of acid reflux and constipation. It reduces the irritants responsible for the gastric and other intestine disorders. 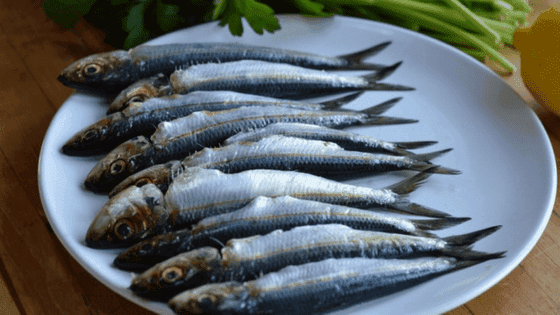 By eliminating the internal causes of skin and muscle disorders and diseases, the sardines induce the ingredients of anti aging elements into the skin and the muscles. Sardines enable smooth circulation and oxygen flow. It can strengthen the heart and the cardiovascular muscles, nerves and the blood vessels. Blood pressure normalization and glucose conversion to glycogen prevent hypertension and diabetic conditions. The results are obviously the disease free skin and fatigue free muscles. One large serving of Egg Yolk contains approximately 55 calories. Total fat is 15%. Protein content is 20%. Carbohydrate content is 5%. Key vitamins are Vitamin-A, D, E and K.
The fastest application of the egg yolk for skin benefit could be the facial mask and skin paste made from the combination with the turmeric powder, honey, and sandalwood paste. It can eliminate the pimples, acne spots, rashes, aging spots, and the other defects on the face and the skin. It can also remove the dots and darkness on the eyelids. Egg yolks contain plenty of vitamins and proteins. It can enhance the production of collagen and Elastin in the skin, connective tissues and the bones when it is consumed as food. 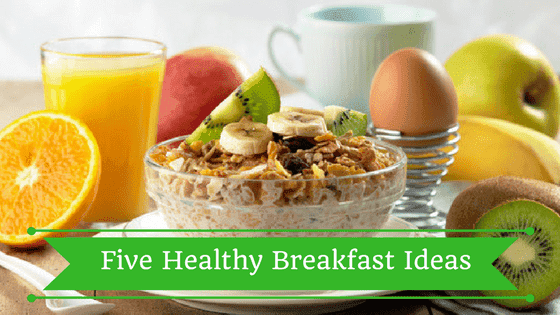 The recommended combination is to add it with one cup of milk in the ratio of 1:3. Digestion and mixing with the circulation becomes faster. Egg yolks can remove the dead skin layers and make way for the new skin layers to grow. It has the tendency to inject the proteins and micronutrients into the newly formed skin cells. It happens gradually through the food consumption and external skin application. 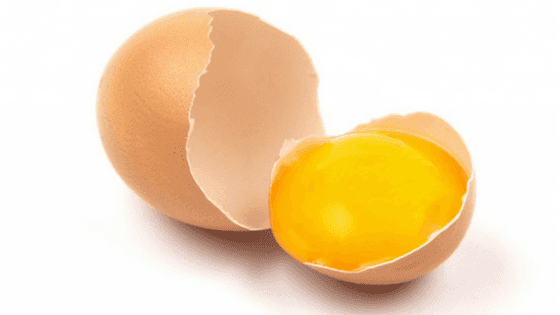 Egg yolks promote muscle growth and mass. It builds up the density of the myofibril fibers and their tensile strength as well as flexibility. The result is the enhanced and optimized growth of the muscle tissues. The muscles develop the tendency to endure the load of weights and stress during the workouts. Once the muscles get strengthened, the anti aging effects can be naturally transferred to the skin and the rest of the internal organs. Anti aging effects are not just limited to the skin and the muscles. They relate to the overall body and the brain, which naturally involves the mind. Hence, the role of metabolic system is very critical for balancing the overall health and fitness. Egg Yolks may contain cholesterol to considerable level. But your body can quickly convert it into the HDL. Egg Yolks help in the elimination of minor irritants that may affect the cardiovascular system. It eliminates the excess of fat, LDL, and facilitates smooth muscle relaxation and strengthening. It clears the blocks in the lungs and enables exchange of oxygen into the circulation. It also strengthens the blood vessels that connect to the different parts of the heart. One cup of Berries contains approximately 48 calories. Total fat is 1%. Protein content is 7%. Carbohydrate content is 86%. Key vitamin is Vitamin-C (136%). It is a rich source of zinc, icon, magnesium, folate, Pantothenic acid, and phosphorous, apart from antioxidants. There are also the other types called the huckleberry, dewberry, barberry, boysenberry, cloudberry, and the others. Regardless of the type you consume, it can provide your skin with plenty of proteins, vitamins and the micronutrients. Berries eliminate the stress and fatigue from the individual cells on your skin. They enable the mitochondria to produce more volume of energy. The cell stability and the average lifespan increase considerably. Similarly, the berries increase the strength and the stability of the tissues. Hydration and nutrition of the skin layers happen from the epidermis to the hypodermis. The berries strengthen the hair follicles and provide them with the required volume of vitamins. They purify the blood vessels and increase the flow of oxygenated blood. The antioxidants remove the contaminants from the skin layers induce a sense of liveliness. Berries also have considerable impact on the improvement of the texture and the tone of the skin, apart from increasing the glow factors. 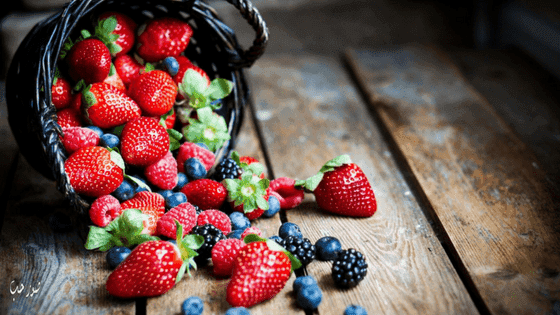 Berries are essential for the healing of soreness on the muscles. It also boosts the muscle strength after you perform the workouts with the weights. They help preserve the muscle strength and develop endurance. They heal the muscle inflammations and relax the tissues. They also eliminate the stress factors from the muscles and increase the resistance to fatigue. The anti aging effects on the muscles have direct implications on the skin health and fitness, as the skin wrinkles and aging lines vanish. Berries contain high value of calories and antioxidants. They clean up the metabolic system and induce appetite. Digestion rate improves and the conversion of foods into nutrients and energy becomes more efficient. You can further enhance the process of metabolism by engaging in workouts that involve your entire body, from the neck to the toes. Berries streamline circulation. They inject large volume of vitamins and proteins into the bloodstream. The combination of oxygen with the nutrients increases the heart muscle strength. It also keeps heart rate at healthy levels. The anti aging effects of a healthy heart can be experienced in the increased efficiency of the cardiovascular system. 1.45OZ of dark chocolate contains approximately 207 calories. Total fat is 22%. Protein content is 3%. Carbohydrate content is 42%. 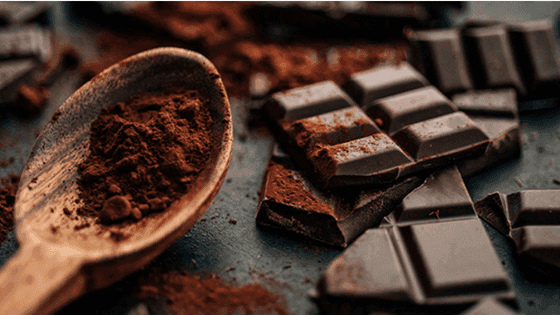 It is a rich source of Cocoa butter, antioxidants, and Cocoa solids. The primary benefit of chocolate for your skin is the protection from UV. It enhances the hydration of your skin and the resistance to external stress factors. The density of the dermis and the hypodermis layers increases to considerable level. So, the heat and humidity of the external environment will have the least impact on the skin health. Chocolate can supply rich volume of carbohydrates to the skin. They protect the skin from dehydration. They boost the energy levels of the skin cells and the tissues. They enhance the resistance to stress and increase the healing power of the platelets in clotting the wounds and preventing the inflammation beyond a certain stage. Chocolate balances the skin temperature during winter by preserving heat in the cells and tissues. So, they don’t become dry due to cold. The preservation of heat also means prolonging the lifespan of the individual cells. It is one way of increasing the anti aging effects on the skin layers. Chocolate helps the muscles store the energy during the pre-exercise stages. It streamlines the circulation and boosts the endurance of the muscles. Chocolate also supplies high volume of calories for the muscles to utilize during the workout. The huge volumes of calories help the myofibril fibers to enhance their density to the maximum levels. They also help in the post workout recovery of the muscles and tissues. When you consume chocolate drink after the workout, the volume of stress and fatigue get reduced considerably. So, you are prepared for your busy daily schedule once you come out of the gym. It is one of the miraculous effects of anti aging foods like the chocolate on your body and mind. Chocolate generates plenty of heat in the digestive systems. The process of food conversion into energy is further increased by the large volume of calories supplied to the metabolic system. Skin, muscles, and the internal organs get their due share of energy, vitamins and proteins. Chocolate increases the strength of the heart and reduces the possibility of heart attack to a great extent. Chocolate also reduces the possibility of heart and cardiovascular related diseases considerably. Hence the lifespan of the heart improves significantly. One cup of chopped cabbage contains approximately 21 calories. Total fat is zero. Protein content is 20%. Carbohydrate content is 76%. It is a rich source of Vitamin-C (48%). The other ingredients are manganese, dietary fiber, folate, copper, and Vitamin K and B11, apart from antioxidants. The large volume of vitamin-C in the cabbage can increase the antioxidant properties considerably. The effect of the UV radiation can generate free radicals on the skin layers, and trigger the possibility of acne, rashes, psoriasis, and the other related skin disorders. Vitamin-C can eliminate the free radicals by converting into neutral and harmless molecules. Hence, the probability of excess sebum secretion reduces to near zero. It also balances the oily skin health. Cabbage contains plenty of minerals for increasing the tensile strength of the skin layers. They promote the generation of collagen and Elastin. The skin becomes firm and flexible. At the same time, the carbohydrate content keeps the skin soft and flexible. Carbohydrates increase the skin’s wound healing and recovery speed. It can eliminate the remnant signs resulting from the infestation of the skin by the diseases and disorders. So, your skin becomes spotlessly clean and hygienic. 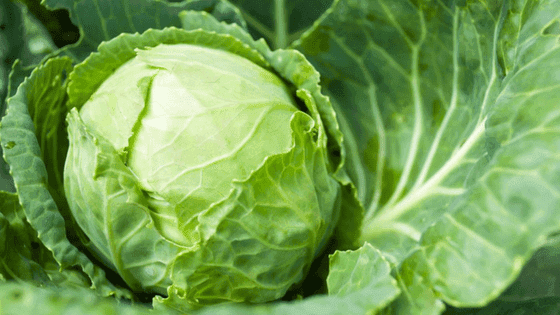 Carbohydrates in the cabbage provide the healing capacity for the muscles. The antioxidants in cabbage can eliminate the toxic elements from the muscles and improve their fitness levels. The most important aspect of the cabbage’s anti aging effects on the skin is the enhanced endurance. Now, the muscles can endure the effects of stress from performing the weight and resistance training. Vitamin-C and the carbohydrates enhance the metabolism efficiency due to the volume of heat generated within the metabolic system. You can further improve it by drinking plenty of water before and after the meals. Cabbage juice is a great antioxidant which can purify the blood. Besides, it cleans the internal organs of the toxic elements. They include the cardiovascular system. It allows more oxygen flow and free circulation. The heart improves its pumping rate and volume my multiple times. The volume of energy generated within the heart and the cardiovascular system remains consistent, regardless of the workout you perform. Hence, the heart condition remains stable and strong. The best anti ageing effects of the cabbage on your heart is its enhanced efficiency and endurance during extreme weather and climatic conditions. The best anti aging effects from the foods you consume get initiated in the skin, muscles, heart, and the metabolic organs. Ultimately it results in an active brain and healthy mind. 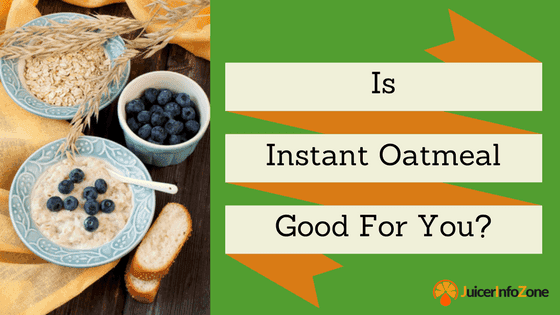 Is Instant Oatmeal Good For You? Juicerinfozone.com is a participant in the Amazon Services LLC Associates Program, an affiliate advertising program designed to provide a means for sites to earn advertising fees by advertising and linking to Amazon.com.